Pearl (?) married Henry Houghton. Jesse Redic Houghton married Lola Phelps in 1914 age 24 and 26. Benjamin Crawford Houghton married Jimmie Rosa Lee Hill in circa 1912. Jimmie Rosa Lee Hill married Benjamin Crawford Houghton, son of Benjamin Franklin Houghton and Martha Jane Johnson, in circa 1912. Jimmie Rosa Lee Hill married James Sherrod Sr age 25 and 22. James Thomas Houghton married Vera H. Morgan in circa 1925 ages 27 and 26. Una Darnell married David Houghton, son of James F. Houghton and Nancy E. Davidson, in circa 1918 age 28 and 18. Henry Taylor Houghton married Clara E. (?) in circa 1912 age 22 and 23. Claudia (?) married Luther Daniel Houghton, son of Richard Basil Houghton and Elizabeth McNary. Ellen (?) married James Houghton. Earle Francis Houghton married Hazel Brown. Evelyn F. (?) married William Houghton. Ida May (?) married Harry Paola Houghton, son of Wilbur John Houghton and Eveline E. Gray, in circa 1901 age 20 and 19. Vaughn Allen Houghton married Pauline A. Tournier in circa 1918 age 31 and 27. Hannah (?) married Charlie Mack Houghton, son of Stapleton Barber Houghton and Hannah Marie Martin. Dr. Robert Stewart Houghton married Crystal M. (?) in circa 1911 age 25 and 19. Crystal M. (?) married Dr. Robert Stewart Houghton, son of Arthur Vincent Houghton and Margaret Ellen Close, in circa 1911 age 25 and 19. William Gay Houghton married Elsie (?) in circa 1917 age 25 and 31. 1920 Census 1920 Wauconda, Lake Co., IL, USA, age 43, general farm manager? 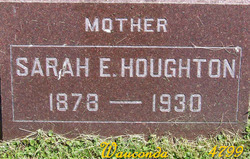 Sadie Ethel Wells married Plutarch Amaziah Houghton, son of Plutarch P. Houghton and Sabina Gray, in circa 1900 at Kenosha, WI, USA, age 24 and 22; mar 9 y in 1910 census. Harry J. Houghton married Mary B. Moore in Jun 3, 1908 at Sidell, IL, USA, age 24 and 22. Mary B. Moore married Harry J. Houghton, son of Elijah Houghton and Mary Jaggers, in Jun 3, 1908 at Sidell, IL, USA, age 24 and 22. Mary Estella Shoup married Charles Vincent Houghton, son of Almon Houghton and Emma Millstead, in Mar 1, 1902 at Peotone, Will Co., IL, USA. Mary B. Breetz married Hugh James Houghton II, son of Hugh Houghton and Margaret Topping, in Nov 7, 1907 at New Albany, Floyd Co., IN, USA, age 23 and 21; mar 3 y in 1910 census. John Houghton married Gertrude (?) in circa 1909 age 22 and 21. Lillian D. (?) married Charles Richard Houghton, son of Marcellus Houghton and Mary (? ), in circa 1906 age 24 and 26; mar 3 y in 1910 census.